Plantar fasciitis is most commonly described as a ‘heel spur’ or ‘heel pain’ and is characterised by pain in the morning, but this is not always the case. 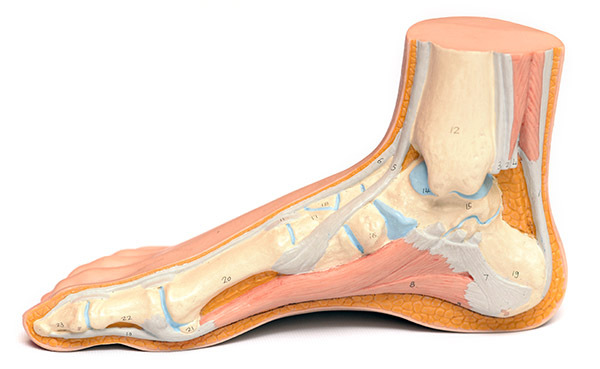 The plantar fascia is a tendon that runs from the heel (calcaneus) to all toes (digits). Causes can include weight gain, tight calf muscles, pronation (rolling in), supination (rolling out). An increase in frequency of exercise, poor footwear or age can also inflame the plantar fascia tendon. An ultrasound differentiates the thickness of the plantar fascia and can determine the presence of a fascial tear in which case it will need to be treated and offloaded with a moonboot. However an ultrasound is not always required. Wearing ideal footwear (as Christian outlined in his previous articles) will help, in particular avoiding thongs or ballet flats as much as possible. Stretching will also assist along with decreasing the frequency of exercise until inflammation subsides. Massaging the tendon by rolling your foot over a ball (such as a tennis ball or speciality massage ball) can help stimulate the healing process however this is quite painful. Strapping and/or orthotic therapy with or without heel raises by your podiatrist is highly recommended to correct the foot position and allow the plantar fascia to heal. A qualified podiatrist will assess the right treatment for each individual case. There is no definitive answer as it is a case-by-case basis. The quicker it is treated, the better the outcome will be. Could it be something other than plantar fasciitis? There are other possible conditions: fractured calcaneus, baxters nerve entrapment, bursitis, achilles tendonpathy, tibialis posterior dysfunction, or particularly Sever’s Disease in children. However plantar fasciitis is the most common heel condition.